The more I looked at our bucket of snowballs, I couldn’t help but think they looked more like a bucket of golf balls. So I thought, why not recycle one craft project into another? And thats when a bucket of golf balls were created. Fortunately I had also bought a green bucket from the $1.00 section at Target at the same time I bought the blue bucket and made up a new sticker label. 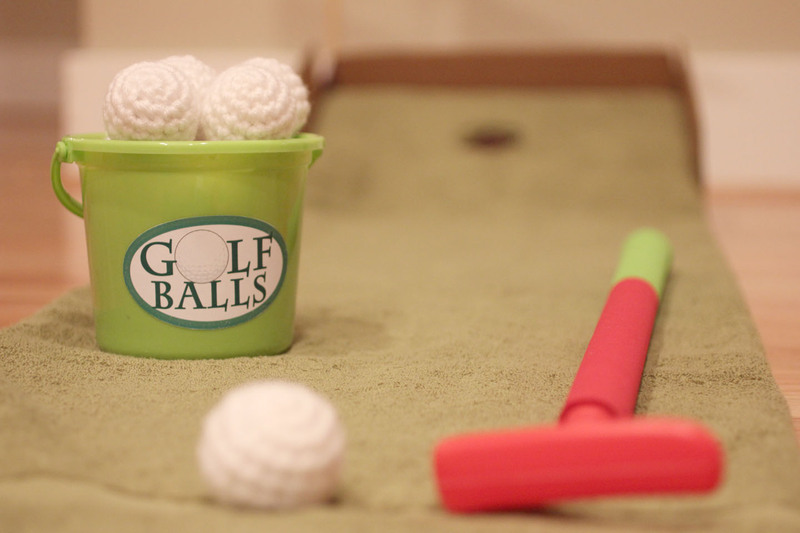 These are same crocheted balls we used for our indoor snowball fight. 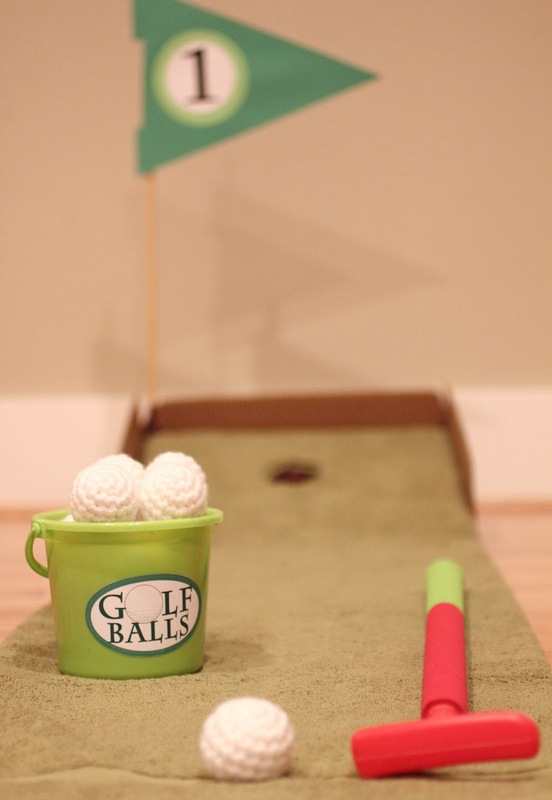 Of course we needed a putting green to go along with our bucket o’ balls. 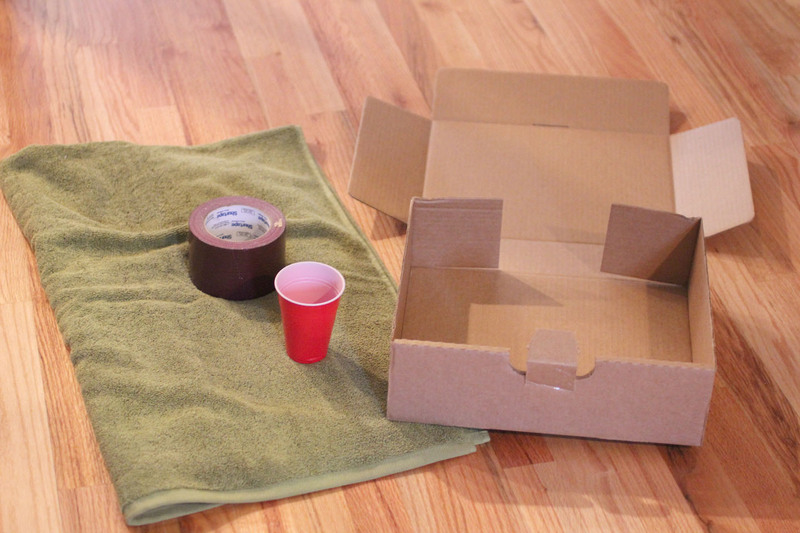 All you need is a cardboard box, a plastic cup, duct tape and a green towel you are willing to cut up. I had the perfect size box laying around. It’s actual dimensions are 12 3/4 x 10 7/8 x 3 15/16. But I am sure you could find a similar box and cut it to size (It does not need to be these exact dimensions but this box happened to be perfect!). I cut the top off the box and then cut the sides at an angle (picture 1). Set the plastic cup next to it and cut it at the same angle as the box (picture 2). trace the opening of the cup on to the center of the cardboard and cut a hole (picture 3). Duct tape your cup inside the hole. Then take your green towel and fold it in half long ways. 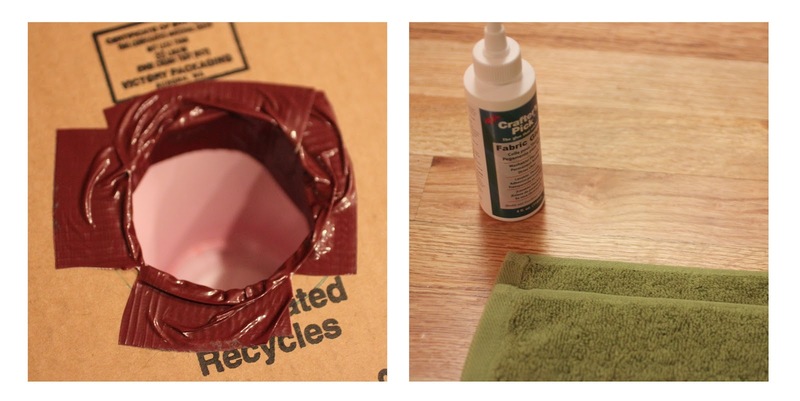 Leave about a 1″ overhang and use fabric glue (or a hot glue gun?) to glue the flap over to create your putting green. My folded towel happened to be the perfect width to fit over the box. After you have it lined up, cut a hole in the towel where your cup is. I duct tape the sides of the towel to the box and then used the flaps from the top of the box as bumpers. As you can see, this doesn’t need to be glamorous. Just keep duct taping till everything is secure. Take note that I let the side of the towel with the decorative line as the teeing off point or is it called a tee box? I made a pennant flag out of construction paper and dowel rod as a finishing touch. I made this Saturday night after the boys went to bed, so this was a fun surprise for big brother when he woke up and came downstairs Sunday morning. 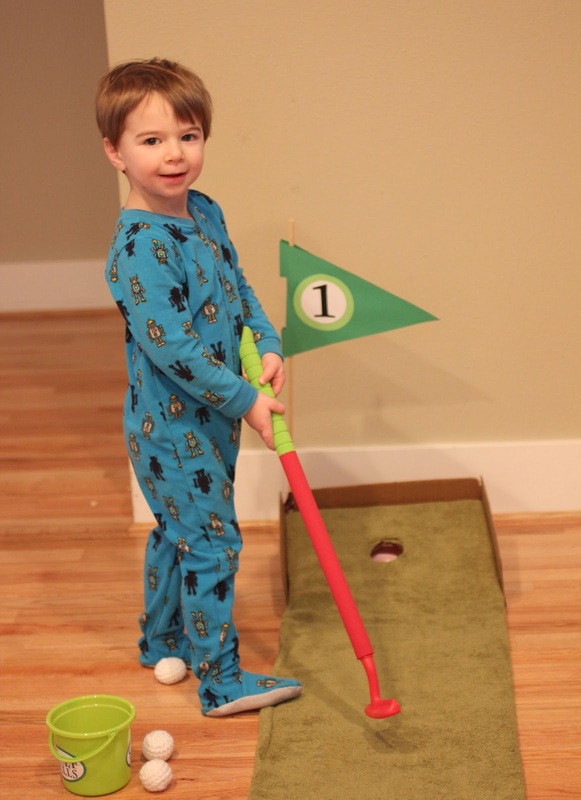 I couldn’t believe it, but he got a hole in one on his first shot! Here is a little video (not the hole-in-one shot unfortunately). Your craftiness and photography skills continue to amaze me!! Thank you so much for sharing your awesome ideas with us Sarah. I posted a link to your post on my Fan Page. Can not wait to pull this out as a surprise rainy day activity for our boys. This is REALLY REALLY REALLY Great!!! I'm so going to make one too!! I really hope you share this over at The DIY Dreamer! Thanks for following my blog and leaving your nice comment! I'm following back! This is such a great idea! My two year old would love it! I'd love it if you'd share this at Whimsy Wednesdays over at http://www.thenymelrosefamily.blogspot.com/2012/03/whimsy-wednesdays-2.html. Well, that "fancy schmancy" camera takes some lovely photos!! I'm hoping for one some day…my little digital camera just isn't cut out for food close up shots. My boys would love this. Please come share at the Anything Goes linky at Bacon Time open now! I love this! Truly great idea! I have pinned and shared. Thanks for linking up with Tuesday Tots! This is such a fun idea! I love it! Thanks so much for sharing with the Crafty Blog Stalker! So cute and such a perfect indoor activity — you can tell Big Brother is having fun! Thanks so much for linking on Busy Monday at A Pinch of Joy! Hope to see you again soon – the links are open! really neat idea! Thanks for posting. 🙂 Always looking for gifts for boys… this is perfect! 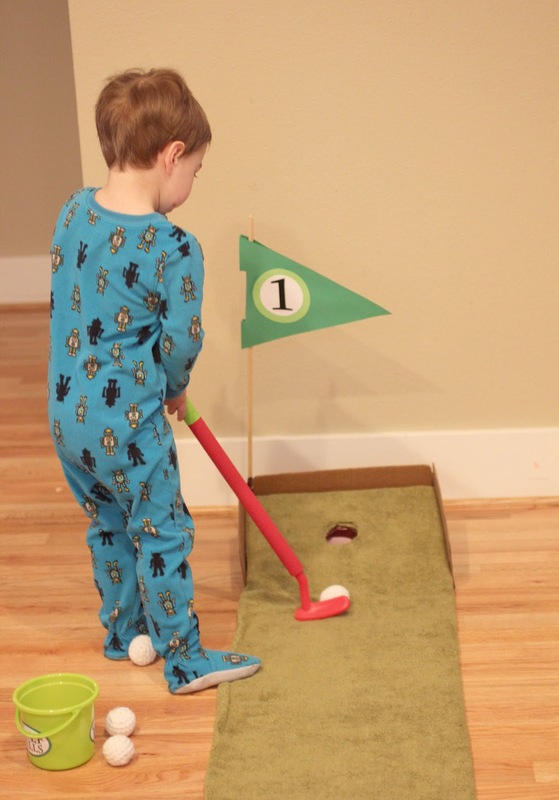 Brilliant my son would love this he's just discovered our garden crazy golf set but if it's too wet to use it then an indoor one would be brilliant. 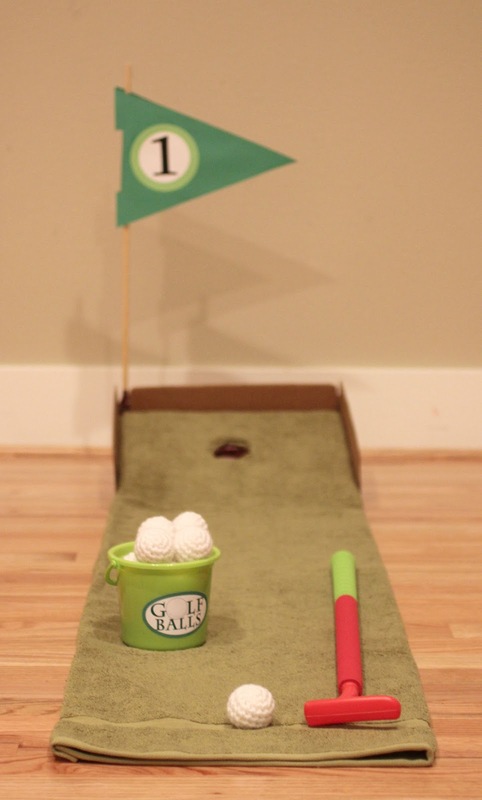 Hmmm, now you got me thinking about making an outdoor putting green! Thanks for giving me the opportunity to share at Tuesday Tots! This is AWESOME!! So much fun 🙂 Thanks for sharing this with us at Sharing Saturday. this is the cutest idea! I would love if you would share this on my linky party!